Semtner has worked with the Latin Ballet of Virginia to develop the dance performances POEMAS and La Passion de Poe. He also co-created the innovative tour/performance Poe’s Haunted Homecoming, which sold out every show for three years. Semtner has presented solo dramatic performances in a variety of spaces around the country and will be appearing this fall at the Garth Newel Music Center in Bath County, VA.
As the curator of the Edgar Allan Poe Museum in Richmond, Semtner has written, co-written, or edited several books about literature, visual art, popular culture, and cryptography. 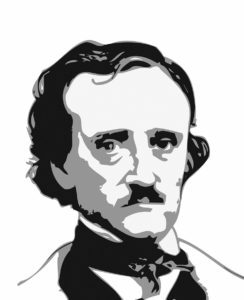 He has provided articles for Biography.com, Crime Writers’ Chronicles, The Edgar Allan Poe Review, and Resources for American Literary Studies. His most recent book, The Poe Shrine: Building the World’s Finest Edgar Allan Poe Collection, is now available at Amazon.com. Semtner regularly speaks to groups around the world about Poe, visual art, horror, and dark history and has been interviewed for documentaries airing on PBS, C-Span, BBC4, Military History Channel, and other networks. Posted on July 31, 2018 by ravenchair. Many cities lay claim to Edgar Allan Poe—Baltimore, Providence, Boston, Philadelphia—but Richmond is the city that he grew up in. Poe called himself a Virginian. Orphaned shortly before the age of three, Edgar was brought to Richmond to be raised by the Allan family. He grew up in Richmond, loved and lost in Richmond, wrote his only novel in Richmond, married in Richmond. Some say that he gave his final reading of “The Raven” in Richmond. If not for his untimely death, he likely would have moved back to Richmond to rekindle a romance with his teenage love. Richmond was important to Poe. And Poe has always been important to RavenCon. One of our founder’s earliest childhood memories is hearing readings of Poe’s “The Black Cat”, “The Tell-Tale Heart” and “The Gold Bug” on public radio at the age of four. He was hooked immediately. When searching for a name for a Richmond-based convention, RavenCon was the obvious choice. Now that the convention has moved to Williamsburg, we’ve lost our obvious Poe connection but not our love for Poe. Besides, sergeant-major Edgar Allan Poe was stationed at Fort Monroe, just 30 miles away from our current hotel. Surely he passed through Williamsburg frequently. We like to think he spent many a pleasant afternoon in beautiful historic Williamsburg. Just like us. For more on Edgar Allan Poe, we recommend visiting the Poe Museum in downtown Richmond. Posted on June 8, 2017 by ravenchair.